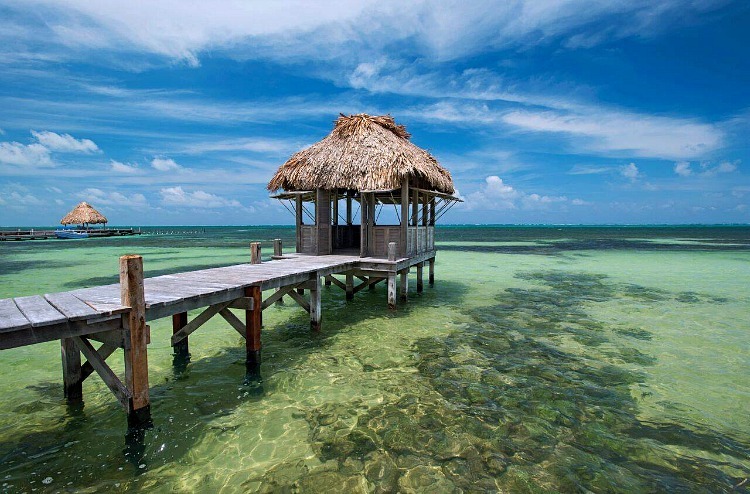 Ambergris Caye is an amazing island off Belize that everyone must visit. A mecca for snorkeling and diving, Ambergris Caye sits right on the Belize Barrier Reef. Being able to SUP, kayak, or swim out to the reef makes it a truly magical place. A laidback beachy atmosphere coupled with so many options for places to eat, sleep, and play makes it perfect for family fun. 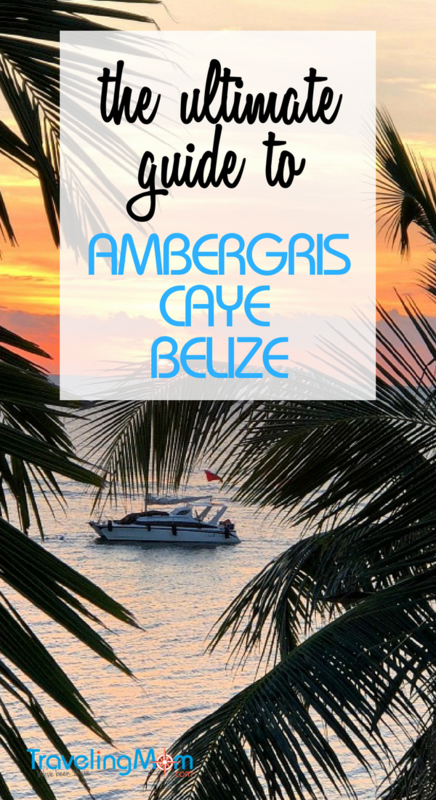 Of course, we sorted it all out for you in this guide to Ambergris Caye Belize Vacations, Luxe TravelingMom style. 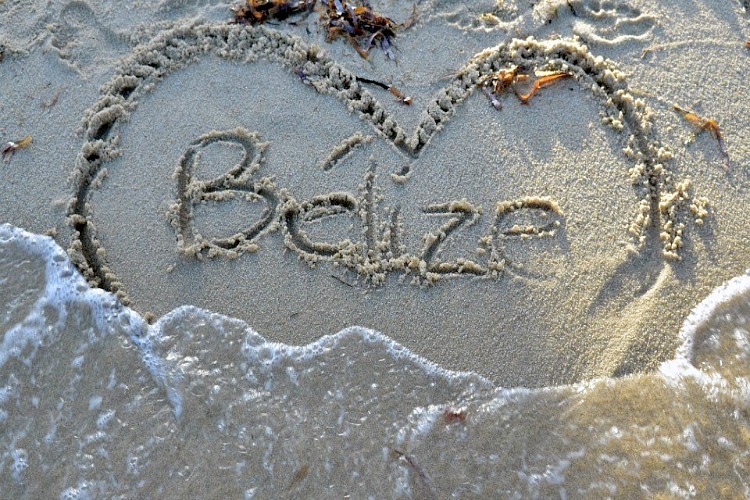 Belize has always held a special place in my family’s hearts. We go to the mainland multiple times a year in the southern most point of Punta Gorda. But this past year, we decided to venture out and explore a new area to us, Ambergris Caye. When we stay on the mainland, we stay in the jungle and venture down to the water a couple of times to fish and snorkel. This year we decided to try the beach instead. What a treat it was! Although much different than our usual spot in the jungle, it was a pure delight. And in full disclosure, we have already booked a trip back to Ambergris Caye this year. Traveling to Ambergris Caye is a breeze and the getting there is half the magic. Simply fly into Belize City and then take a short flight on Tropic Air to San Pedro Airport. 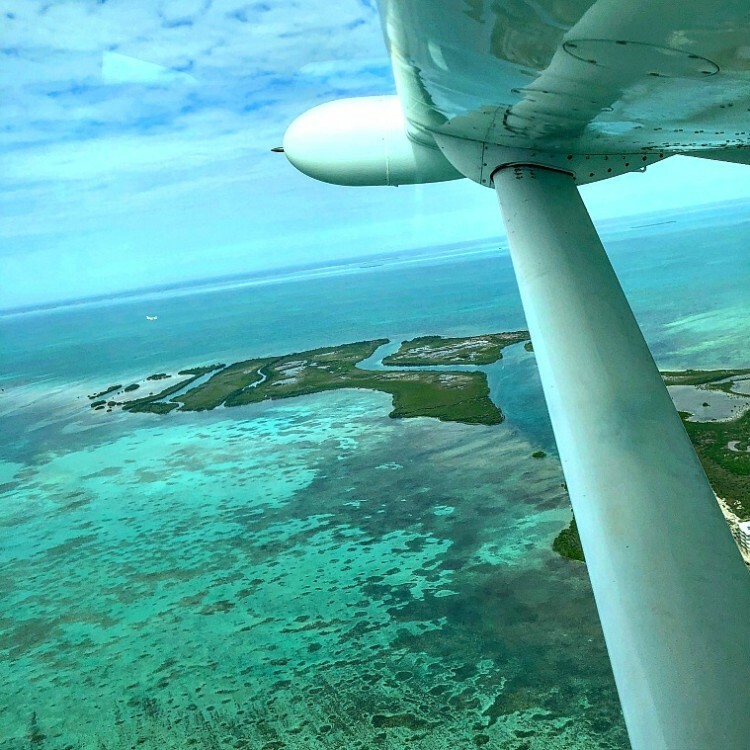 It is a gorgeous flight that takes you over the Belize Barrier Reef! Your resort can then pick you up or you can rent a golf cart to get around for your stay. No need for a car. Arriving on Ambergris Caye Belize. Photo credit Dana Zucker, Luxe TravelingMom. 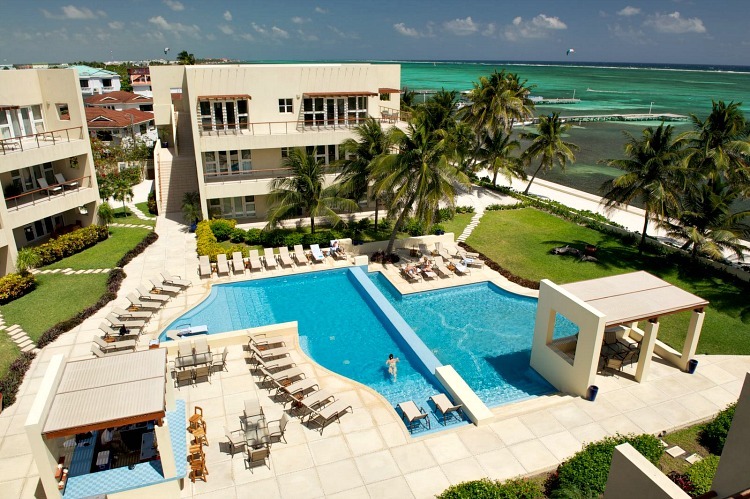 The Phoenix Belize – Located right downtown in San Pedro, the Phoenix Belize is our favorite place to stay. It is a small resort with wonderful pools and spacious accommodations. Each condominium has a full kitchen, spacious living areas, wonderful bedrooms, and laundry! We also love the big balconies. There is a restaurant on site as well as a bar, children’s programs, and other activities offered all day. You are a short walk away from the water and all the markets, restaurants, shops, and so much to do. And if you want a fabulous spa, it is right on site! But what we loved most was the staff. They were all so wonderful, accommodating, and were able to arrange anything we wanted. The pool at The Phoenix Belize on Ambergris Caye. Photo credit The Phoenix Belize. Victoria House Resort & Spa – If you prefer more options and a true resort style getaway, the Victoria House and Restaurant would be perfect. Located on the South part of the island, Victoria House has wonderful spaces both inside and out. In terms of accommodations, you can choose between resort rooms and homes to stay in. All are beautiful and spacious. 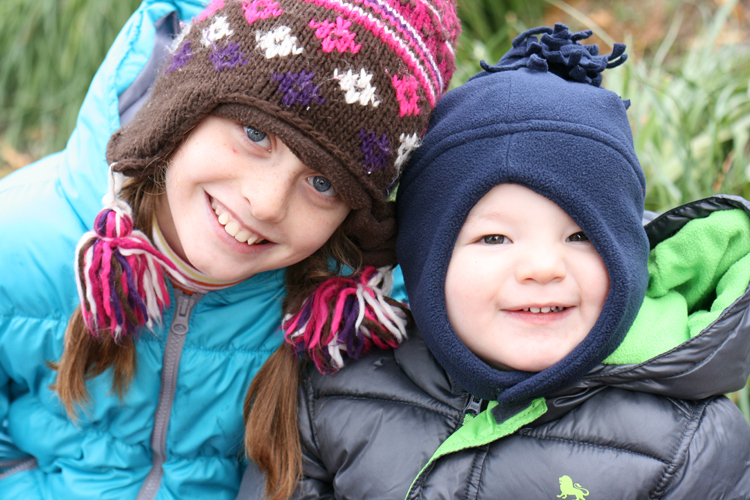 There is so much to do on property for everyone in the family, there is no reason to ever leave. Besides, the food is wonderful and the spa is a treasure in itself. 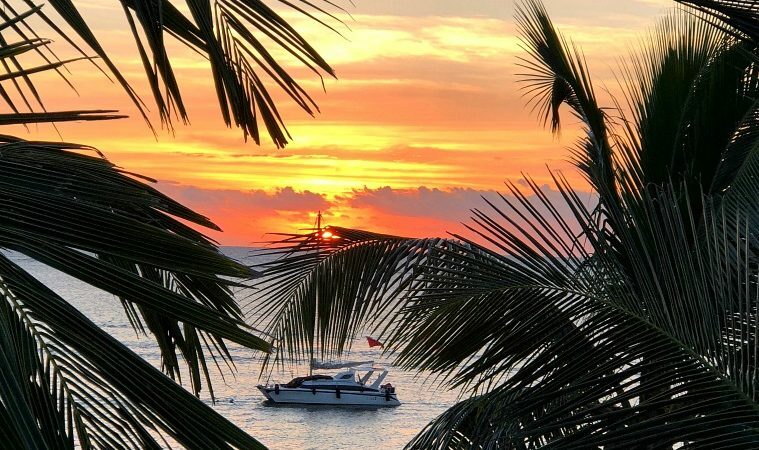 What a view from Victoria House Resort & Spa. Credit Victoria House Resort. 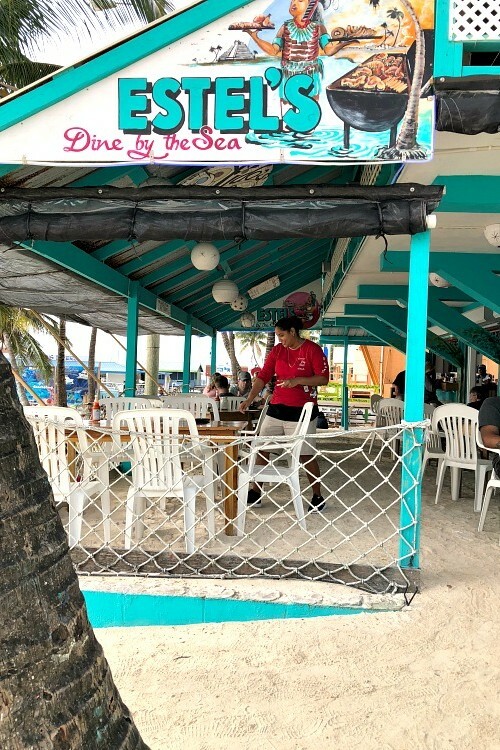 There are so many wonderful local places to eat on Ambergris Caye. But we do highly recommend that you book a beach BBQ with a snorkel at least one day. Your guide will dive for your food while you snorkel. Then he’ll take you to a beautiful spot to enjoy your picnic. While it is hard to pick just a few others to share, here are the top three that we have been to over and over. 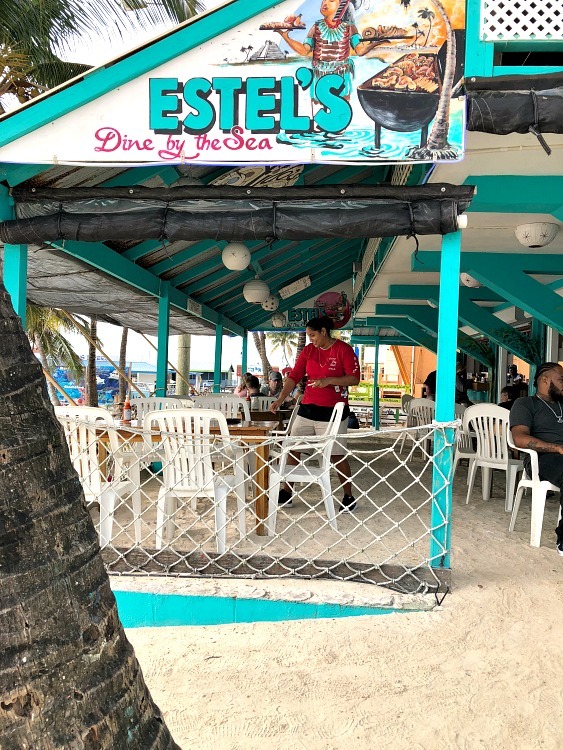 Estel’s – An Ambergris Caye classic right on the beach, Estel’s is a must-do! In fact, a must do over and over again. You simply walk inside and check out the daily chalk board on the floor in the back of the restaurant. Then decide what you would like, let a staff member know, and find a table. We prefer to sit out on the beach under a tree and wait for our food. Don’t forget to grab a coconut out of the cooler to enjoy while you wait. Outdoor dining on the beach at Estel’s. Photo credit Dana Zucker, Luxe TravelingMom. We love breakfast at Estel’s and always order the lobster omelet. It comes with fresh fruit or potatoes and bread with local delicious papaya jelly. Besides the food, people watching is the best at Estel’s. We could sit there all day! Caramba’s – If you want fresh local seafood cooked the way you want it, there is no better place than Caramba’s. As you walk down Middle Street, you cannot miss the action at Caramba’s. All the food is located outside for you to pick and then have brought to the kitchen cooked just for you. The “fish man” at Carmba’s in Belize. Photo credit Dana Zucker, Luxe TravelingMom. When you arrive you will be seated, order your drink and a starter, then head outside to pick your seafood. The “fish man” will assist you in picking what you would like. We suggest having what is in season. 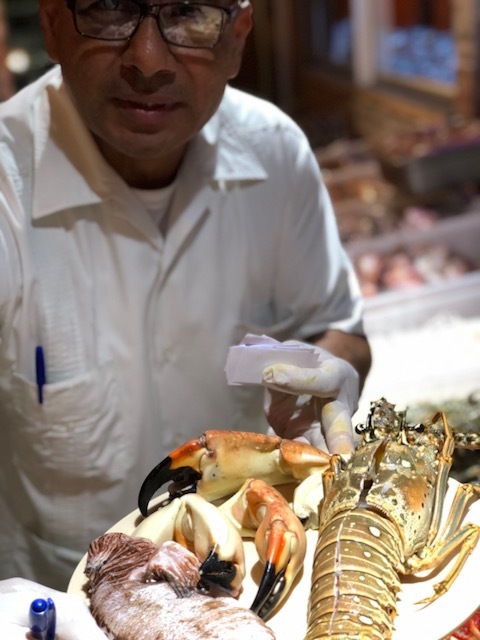 We have had it all, including conch, lion fish, spiny lobster, crabs, hog fish, and so much more. Once you pick your fish, your waiter will assist you in cooking styles. Please do not get it all fried. We allow our waiter to pick the best preparation. You will also be able to pick sides. Again, please enjoy some of the local specialties. Wild Mango – Also located on the beach street, Wild Mango is perfect for a cocktail and ceviche. Located next to the ferry station, the restaurant is always busy. Maybe that’s because it is the perfect place to sit and watch the water while you sip a mojito, our favorite cocktail. Or because they do ceviche so many ways! And you should not have just one ceviche. Order many and enjoy. We suggest the classic, the fire and ice, and the tai ceviche. Each is served with delicious chips. The other not to miss item on the menu are the disco fries! 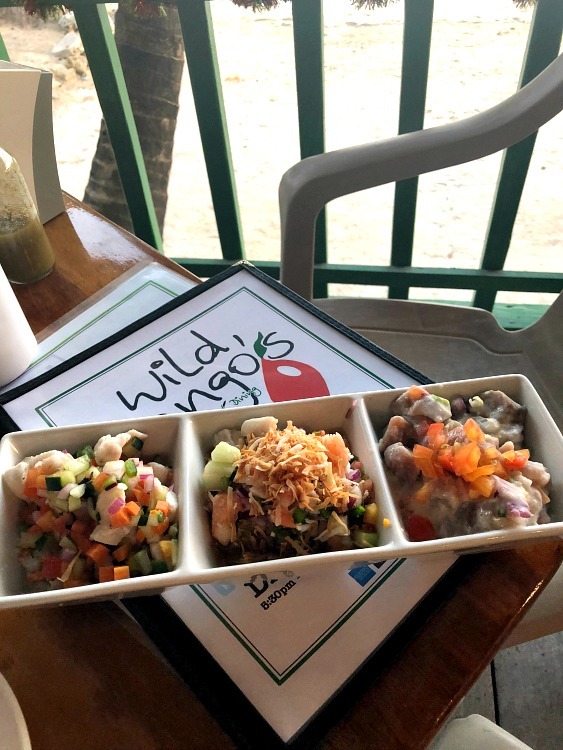 A few of the ceviche choices at Wild Mango’s. Photo credit Dana Zucker, Luxe TravelingMom. Ambergris Caye is the perfect playground for the water baby in you. 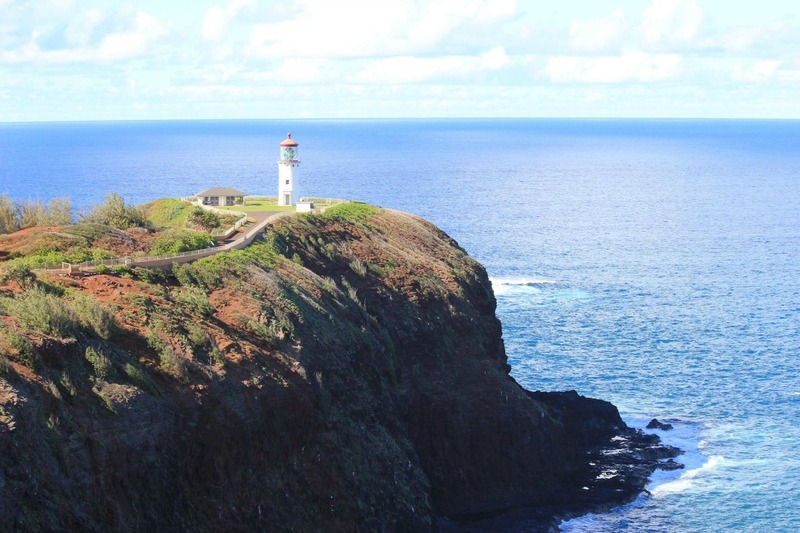 But you should take at least one day to explore the entire island by golf cart. Getting around is a breeze with basically three streets that run the distance of the island. Front Street is actually the beach and sand. The other two are Middle Street and Back Street. We like staying right in the center of town, making it easy to get to markets and restaurants. But you cannot pick a bad location on the entire island. If you want to be off the water, the town is walkable and full of shops. You can shop for local products like chocolate, art and beautiful hand crafts. 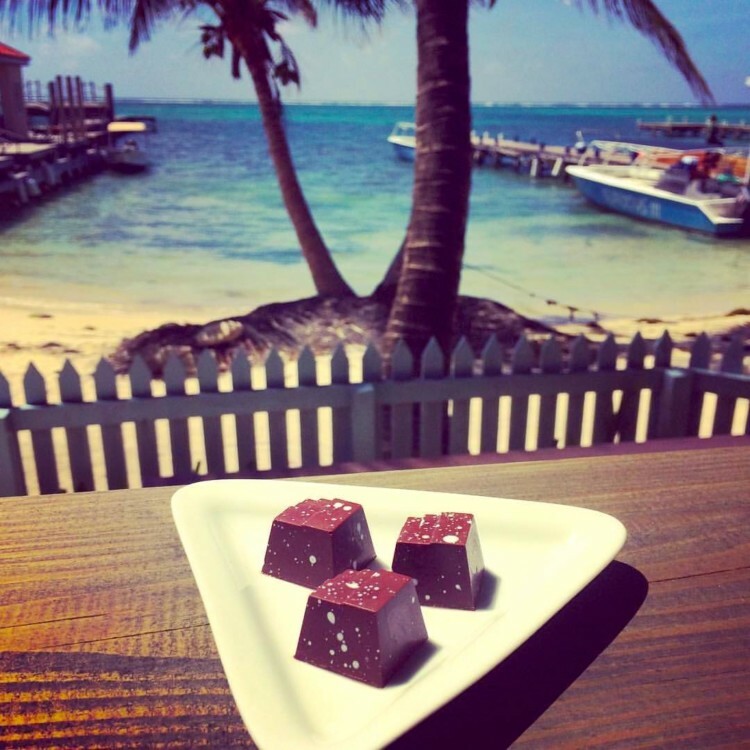 Just make sure you visit the Belize Chocolate Shop before you leave. Chocolate and the beach…Photo credit Dana Zucker, Luxe TravelingMom. Belize Barrier Reef – There is one thing and only one thing only that you must do and that is snorkel at the Reef. You can literally kayak out to any spot and enjoy, but we highly suggest you book a trip to Hold Chan Reserve. It is simply the most beautiful spot. You will see absolutely everything there. 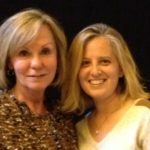 Here are two tips. First, book a private boat and go between the busy times to avoid the crowds. Second, be aware of the delicate natural wonder. Avoid wearing chemical sunscreens, use a swim clothing with built in SPF, and do not touch anything! Fishing – No matter the type of fishing you love, it is available at Ambergris Caye. We are fly fishing addicts so Ambergris Caye is what we call the honey pot. 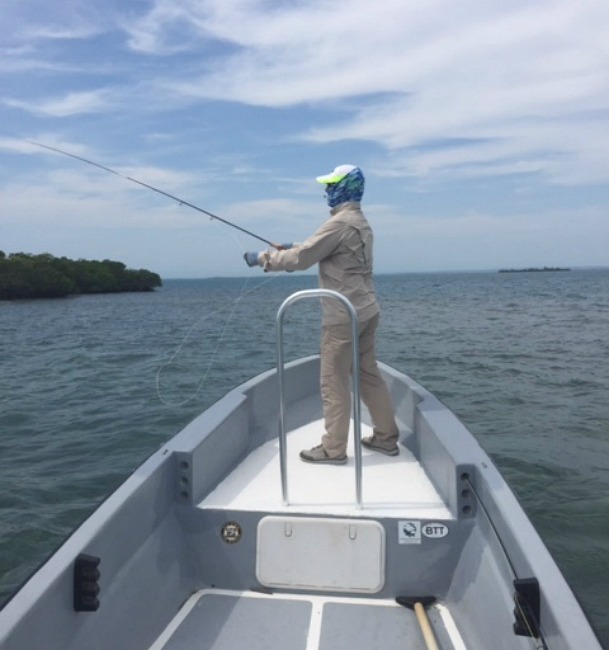 You have the grand slam of fly fishing at your finger tips: bonefish, tarpon, and permit. If you love deep sea fishing, in a half day adventure you can catch enough fish to feed the entire island. For the more adventurous, you can find many areas to spear fish for lobster, lion fish, and so much more. It is a true fisherman’s dream. Fly fishing the waters of Belize. Photo credit Dana Zucker, Luxe TravelingMom. Water Sports – The water sports are endless on Ambergris Caye. If you are staying at one of the larger resorts, they will have everything available for you right there. But do not worry if your resort, hotel or rental does not have water sports on site; they will be able to arrange it for you. And there will be so many choices. Our favorites are kayaking and taking SUP boards to the reef, tying up, and snorkeling. 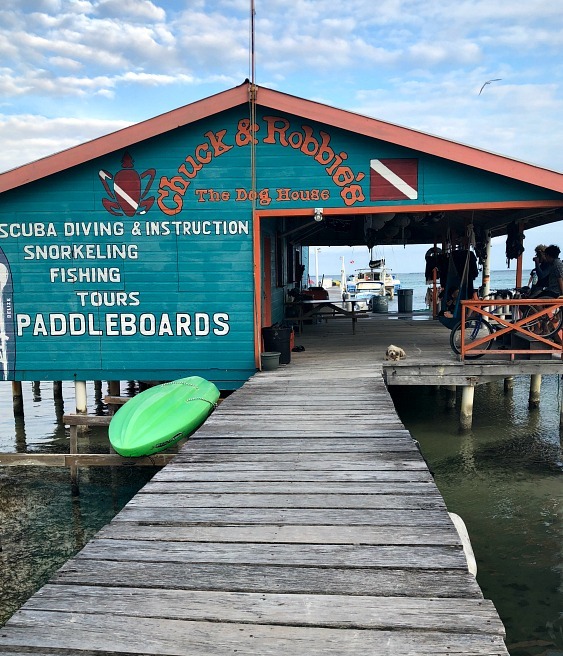 Find your favorite watersports on Ambergris Caye Belize. Photo credit Dana Zucker, Luxe TravelingMom. Belize vacations have so much to offer, but a trip to Ambergris Caye is a wonderful adventure or quiet retreat. So, when are you booking your trip?